Background: In the present study, otitis media with effusion (OME) or "glue ear," is serous or mucoid, but not mucopurulent, fluid in the middle ear. Children usually present with hearing impairment and speech problems. Hearing impairment is usually mild and often identified when parents express concern regarding their child's behavior, performance at school, or language development. There are many medical treatment options in OME such as systemic antibiotics, oral or topical steroids, anti-histaminics, and decongestants however, there actual role and efficacy is controversial. Topical nasal steroids are one of the better treatment options because of its fewer side-effects compared to oral steroids. Objective: To assess effectiveness of topical nasal steroids (mometosone nasal spray) in hearing loss associated with OME in children. Materials and Methods: One hundred and six children of age group 2-8 years with otoscopy and tympanometry diagnosed cases of OME were enrolled for this study and randomly allocated into two groups, children in the study group were treated with topical nasal steroids (mometosone nasal spray) for period of 3 weeks and children in control group (no treatment) were observed without treatment. On a total of 106 children, 14 lost to follow-up and were excluded from study and the rest of 92 children were studied in this study. Outcome of treatment was measured with closure of air bone gape on pure tone audiometery done after 3 weeks of treatment, 3 weeks after tapering treatment and 3 weeks after stopping treatment. Results: Demographic comparison was insignificant between the two groups. Patients in study group showed significant closure of air bone gape on pure tone audiogram after 3 weeks of treatment, and 3weeks after tapering treatment. Study group patients showed improvement in hearing 3 weeks after stopping treatment but that improvement was not statistically significant. Conclusion: The present study suggested that topical nasal steroids has a role in treatment of OME and can be used as a short-term treatment option until long-term treatment option like myringotomy and ventilation tube insertion is planned and accomplished. Otitis media with effusion (OME) is defined as a collection of fluid in the middle ear without signs or symptoms of ear infection. It typically arises when the Eustachian tube More Detailss are not functioning normally. When this happens, pressure changes occur in the middle ear and fluid can accumulate. There are several pre-disposing environmental factors that are associated with an increased risk of developing OME. These includes exposure to second hand smoke, attending child care, and having environmentally induced allergies. Many patients with OME require no specific treatment. The most common medical treatment options include the use of decongestants, mucolytics, steroids, antihistamines, antibiotics and auto-inflation. Surgical treatment options include grommet insertion, myringotomy (tympanocentesis, i.e., surgical incision of the ear drum, with or without aspiration of fluid fromthemiddle ear cavity) and adenoidectomy. The optimal treatment strategy remains controversial. The present study was performed at the department of otorhinolaryngology Government Medical College, Srinagar, Jammu and Kashmir, India during the period between September 2011 and November 2012 and was approved by the Institutional Ethics Committee. One hundred and six children of age group 2-8 years with otoscopy and tympanometry diagnosed cases of OME were enrolled. Out of these 14 children lost to follow-up and were excluded from study, rest of 92 children were randomly put in two groups. 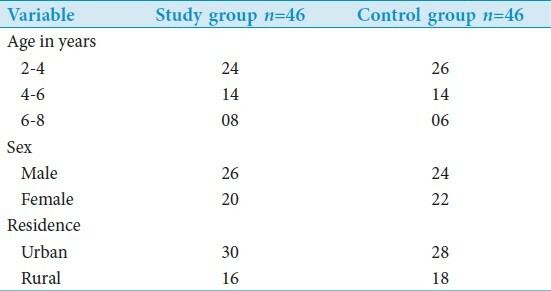 Exclusion criteria were syndromic children and children with cleft palate.The randomization was allocated by random number table, use by the even and odd numbers in equal proportions. The even numbers in random number table represented the control group while the odd numbers represented the study group. In 46 children in the study group intra nasal steroids was given as treatment for period of 3 weeks and then dose of steroids was gradually tapered over further 3 weeks of time and then steroids were stopped. Pure tone audiometry was done at the time of presentation in our department and after 3 weeks of treatment, 3 weeks after tapering treatment and 3 weeks after stopping treatment. Similarly, for children in the control group (no treatment) pure tone audiometry was done at the time of presentation, after 3 weeks, after 6 weeks and after 9 weeks. The closure of air bone gap between the two groups was compared. We studied 106 children who were diagnosed as OME. Out of these 106, 14 lost to follow-up and were excluded from study. And the rest of 92 children were put in two groups. Forty six children receive intra nasal steroids as treatment and 46 children were observed without treatment. The demographic data of these two groups of patients is given in [Table 1]. Result of pure tone audiometry in both groups of patients at presentation, after 3 weeks, 6 weeks and after 9 weeks is given in [Table 2]. Demographic comparison was insignificant between the two groups. Patients in study group showed significant closure of air bone gape on pure tone audiogram after 3 weeks of treatment, and 3weeks after tapering treatment. Study group patients showed improvement in hearing 3 weeks after stopping treatment but that improvement was not statistically significant. In the present study, we assessed the role of topical nasal steroids on hearing impearmentin children affected due to OME. Only one study (Williamson 2009),  which compared topical intranasal steroid with placebo, reported on hearing loss, for which there was no benefit. Nuss and Berman et al included studies published in abstract form only (Heary 1990) and a non-randomized, open study (Persico 1978). They concluded that combination therapy (oral steroids plus antibiotics) is worth considering in children with OME persisting beyond 8 weeks prior to surgical intervention. Rosenfeld et al. performed a meta-analysis of six randomized trials, and concluded that children receiving oral steroids for 7-14 days were 3 times more likely than control subjects to have both ears free of effusion at the end of therapy (95% confidence interval [CI] 2.2-4.1). They also found significant heterogeneity between studies. Three of the studies involved treatment with oral steroid plus antibiotic (odds ratio favoring steroid plus antibiotic treatment 2.8; 95% CI 2.0-4.0) and three oral steroid alone. In study conducted by Simpson et al. there is some evidence demonstrating short-term improvement of OME from oral steroids, especially when used in combination with antibiotics, However, they found no evidence for lasting beneficial effect on effusions from oral or topical intranasal steroid treatment. Our study showed short-term improvement in hearing loss due to OME in children after using topical nasal steroids. Large randomized controlled studies are needed to compare nasal steroids to other modalities of treatment, but this study shows nasal steroids to be effective method of improving hearing loss in OME patients after using the same for 3 weeks. Therefore, the use of nasal steroids should be further promoted and implemented as short-term therapy in hearing impaired children associated with OME. 1. Stool SE, Berg AO, Berman S, Cooley JR, Culpepper L, Eavey RD. Otitis Media With Effusion in Young Children. Clinical Practice Guideline No. 12. Rockville, MD: Agency for Health Care Policy and Research, AHCPR Publication No. 94-0622; 1994. p.1998-108 . 2. Shekelle P, Takata G, Chan LS, Mangione-Smith R, Corley PM, Morphew T, et al. Diagnosis, history, and late effects of otitis media with effusion. Evidence Report/Technology Assessment No. 55 (Prepared by Southern California Evidence-based Practice Center under Contract No 290-97-0001, Task Order No. 4). Rockville, MD: Agency for Healthcare Research and Quality; AHRQ Publication No. 03-E023; 2003. p.1-5. 3. Paradise JL, Rockette HE, Colborn DK, Bernard BS, Smith CG, Kurs-Lasky M, et al. Otitis media in 2253 Pittsburgh-area infants: Prevalence and risk factors during the first two years of life. Pediatrics 1997;99:318-33. 4. Tos M. Epidemiology and natural history of secretory otitis. Am J Otol 1984;5:459-62. 5. Williamson IG, Dunleavey J, Bain J, Robinson D. The natural history of otitis media with effusion - A three-year study of the incidence and prevalence of abnormal tympanograms in four South West Hampshire infant and first schools. J Laryngol Otol 1994;108:930-4. 6. National Collaborating Centre for Women′s and Children′s Health. Surgical Management of Otitis Media With Effusion in Children. London: National Institute for Health and Clinical Excellence; February 2008. Available from: http://www.nice.org.uk/nicemedia/live/11928/39633/39633.pdf [Last accessed on June 2013]. NICE Clinical Guideline 60. 7. Haggard M. Screening childrens hearing. Br J Audiol 1992;26:209-15. 8. Gouma P, Mallis A, Daniilidis V, Gouveris H, Armenakis N, Naxakis S. Behavioral trends in young children with conductive hearing loss. Eur Arch Otorhinolaryngol 2011;268:63-6. 9. Bennett KE, Haggard MP, Silva PA, Stewart IA. Behavioral and developmental effects of otitis media with effusion into the teens. Arch Thos Child 2001;85;91-5. 10. Chantzi FM, Kafetzis DA, Bairamis T, Avramidou C, Paleologou N, Grimani I, et al. IgE sensitization, respiratory allergy symptoms, and heritability independently increase the risk of otitis media with effusion. Allergy 2006;61:332-6. 11. Gravel JS, Wallace IF. Effects of otitis media with effusion on hearing in the first 3 years of life. J Speech Lang Hear Res 2000;43:631-44. 12. Rosenfeld RM, Culpepper L, Doyle KJ, Grundfast KM, Hoberman A, Kenna MA, et al. Clinical practice guideline: Otitis media with effusion. Otolaryngol Head Neck Surg 2004;130:S95-118. 13. Sano S, Kamide Y, Schachern PA, Paparella MM. Micropathologic changes of pars tensa in children with otitis media with effusion. Arch Otolaryngol Head Neck Surg 1994;120:815-9. 14. Rosenfeld RM, Culpepper L, Doyle KJ. Role of steroids in management of otitis media with effusion. Arch Otolaryngol Head Neck Surg 1992;118:149-52. 15. Ducharme FM. Inhaled glucocorticoids versus leukotriene receptor antagonists as single agent asthma treatment: systematic review of current evidence. BMJ 2003;326:621. 16. Olynyk JK, Yeoh GC, Ramm GA, Clarke SL, Hall PM, Britton RS, et al. Gadolinium chloride suppresses hepatic oval cell proliferation in rats with biliary obstruction. Am J Pathol. 1998;152:347-52. 17. Williamson I, Benge S, Barton S, Petrou S, Letley L, Fasey N, et al. Topical intranasal corticosteroids in 4-11 year old children with persistent bilateral otitis media with effusion in primary care: double blind randomised placebo controlled trial. BMJ 2009;339:b4984. 18. Berman S, Grose K, Nuss R, Huber-Navin C, Roark R, Gabbard SA, et al. Management of chronic middle ear effusion with prednisone combined with trimethoprim-sulfamethoxazole. Pediatr Infect Dis J 1990;9:533-8. 19. Persico M, Podoshin L, Fradis M. Otitis media with effusion: A steroid and antibiotic therapeutic trial before surgery. Ann Otol Rhinol Laryngol 1978;87:191-6.